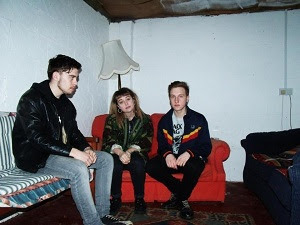 I'm a little bit late on the scene with the debut single from Notts grunge trio Kagoule, which came out at the end of February. Although we were ahead of the curve in some ways, having written about the band last summer - so swings and roundabouts. Have a listen to the fuzzy 'Monarchy' and shoegaze-infused 'Mudhole' below. Since we first wrote about Kagoule last year, they've been bigged up by the (hopefully returning) Late Of The Pier - who we co-incidentally discussed in our initial post. Faley from said band has actually been working with Kagoule for a while, and is one part of Denizen Records, who have put out their debut single. Looking forward to seeing where his guiding hand will help take the band. Purchase 'Monarchy'/'Mudhole' on 7" vinyl at Bandcamp.